MEXICO CITY, Feb 11 2014 (IPS) - “In the long term, what benefit will regulation of the autodefensas [self-defence groups] bring us? Do you think I have an aptitude or professional vocation for police work?” asked Juan Carlos Trujillo, a peace activist in the Mexican state of Michoacán. Trujillo, from Pajacuarán in Michoacán, was displaced from his home by violence and has four siblings who have been forcibly disappeared. He is not hopeful about the latest strategy of the government of President Enrique Peña Nieto in the war being fought in this southwestern state. 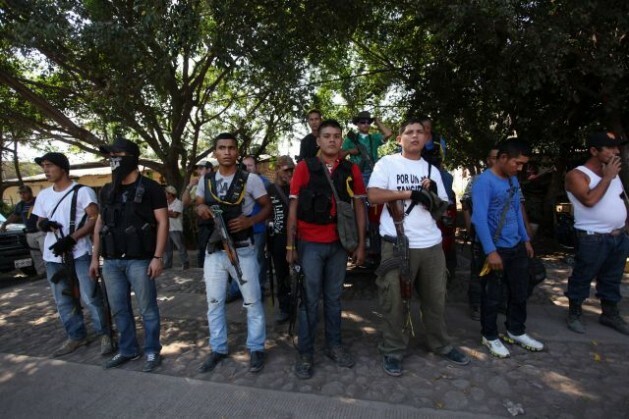 The battle is being waged between the Caballeros Templarios (Knights Templar), the region’s main drug trafficking cartel, and the Michoacán “autodefensas” or vigilantes, a loose confederation of vigilante groups formed in April 2013 who have taken the law into their own hands in response to the state’s failure to provide security. After months of armed conflict that reached a peak in January, the self-defence forces joined police and soldiers on Feb. 9 in taking the city of Apatzingán, regarded as a Templar stronghold, without a shot and without capturing a single cartel leader. The operation followed the signing on Jan. 27 of an unprecedented pact between the Mexican government, Fausto Vallejo, the governor of Michoacán, and autodefensa leaders, agreeing to Peña Nieta’s decision to incorporate 10,000 illegally armed civilians in Michoacán into the Rural Defence Corps of the municipal police. The first item of the eight-point agreement stipulates that “the autodefensas will be institutionalised by incorporation into the Rural Defence Corps.” The vigilante groups are to present lists of their members’ names and come under the control of the Mexican army. In the complicated jigsaw puzzle that is Michoacán, the agreement convinced nobody. Security experts have warned of the dangers of legitimising a paramilitary model. Erubiel Tirado, a researcher at the Ibero-American University, told Proceso magazine that the government is “fighting lawlessness with lawlessness” and has made the autodefensas “a modern version of Chucho el Roto,” the nickname of Jesús Arriaga (1858-1894), a legendary Mexican bandit who, like Robin Hood, robbed the rich and gave to the poor. Another concern, particularly of human rights organisations, is that the same rules are being applied to different self-defence groups that have recently arisen in the country. “You cannot enforce a general measure on all the autodefensas. They must be understood on a case by case basis,” attorney Karla Michelle Salas of the National Association of Democratic Lawyers told IPS. In her view, “cases like Cherán or the community police in Guerrero must be seen differently, as the autodefensas here have taken historic forms of people’s organisation according to local customs and practices. “We don’t all have to become police because the state fails to guarantee security as it should. Many within the autodefensa groups are not interested in continuing to bear arms, and when the state does its job they will be able to lay down their weapons,” Salas said. The High Council of the indigenous community of Cherán, of 13,000 people, is also suspicious of the agreement. “We took care not to register our names” in the autodefensas regularisation agreement, one of the Council members, Trinidad Ramírez, told IPS. “They want to coopt them for the police, but the police have often been involved in crime, so no good can be expected to come of it,” he said. Cherán is a community of native Purépecha people that became famous in April 2011 when it barricaded itself against criminal groups that were seizing farms and destroying forests, removed its municipal authorities and set up its own traditional government. Since then, the town has been surrounded by ditches and barricades and is protected by local people themselves. Disarming does not even occur to the Purépechas as a possibility. “We are not going to lay down our arms,” Ramírez said. “We have learned lessons because people have memory. And no one is putting a stop to crime in Michoacán,” where the mafias “are just regrouping,” he said. The situation could hardly be more complex. Meanwhile, many analysts view the agreement as little more than a ploy for positive publicity by Peña Nieto. No one is predicting a rapid solution to the conflict, in which the Mexican government’s attitude has been ambivalent. The autodefensas provide the regular forces with information, and have accompanied them on several operations and offensives to recover towns under Templar control. But at other times they have been isolated. On Jan. 13, the government launched an operation to disarm the self-defence groups, leading to the deaths of three civilians. However, the autodefensas did not disarm and on Jan. 21 there was a three-hour gun battle between Templars and autodefensas in two communities in the municipalities of Parácuaro and Apatzingán, while an army helicopter circled overhead with orders not to intervene, according to local reporters. It’s a yo-yo strategy — hitting then hand-holding, said Arturo Cano, an experienced reporter for the national daily La Jornada. And for the local people of Michoacán, hopes of living a normal life remain distant. “I would like to go back to my village and create an organisation to monitor the authorities,” said activist Trujillo. “I think members of the autodefensas could do the same, not as groups integrated into the state, but as part of a citizen observatory. That is my modest opinion, but right now we do not have the right conditions,” he said. Trujillo is one more victim of the Mexican war on drugs, launched by former president Felipe Calderón (2006-2012), that has left more than 80,000 people dead and 20,000 disappeared.